You probably haven’t thought about your AC maintenance. And after almost a year, it needs more than just a tune-up. It needs a System ReJUVenation! The problem is that some HVAC contractors do tune-ups cheaply and badly. They’ll take a look, throw in a filter and say it’s tuned up. But One Hour makes tired, dirty home comfort systems work like new again. over the next six months, guaranteed. If it does, we’ll apply the cost of the ReJUVenation to your repair. off of your next six months of electric bills compared to last season. If not, we’ll return your investment, NO QUESTIONS ASKED. You and you alone judge the value of our ReJUVenation. If you feel for any reason you’re not satisfied, tell us… and YOU DON’T PAY. Your satisfaction is 100% guaranteed. What’s done during a System ReJUVenation? 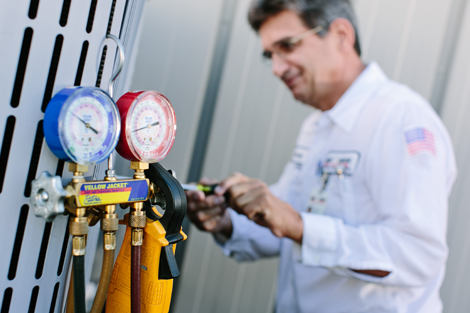 Conduct a 71-point diagnostic, which includes Freon levels and operating temperatures. Professional cleaning of all dust and baked on plaque from your air conditioner’s coils. This allows it to cool more quickly AND efficiently. We’ll make sure your air filter is clean and not restricting your system’s airflow. See why we don’t call it a tune-up? THEN we recalibrate your system to factory-fresh specifications. It will run like new again, so it’s easy for us to guarantee it. If we find a broken or worn out component, we’ll show you and you can decide if you’d like us to fix it. If you don’t want us to fix it, no problem, but we won’t pretend that a ReJUVenation can fix a legitimate problem.